Casimir Dadak, who joined the faculty in 2000, has been promoted to full professor. He teaches business and finance courses—in particular, corporate finance, investments, international finance, and strategic management. He earned an M.A. in economics from the Academy of Economics in Krakow, Poland, and a Ph.D. in economics at Fordham University. Before leaving his native Poland for the United States, he served for nearly a year as the head of the departments of economic analysis and foreign relations at the Solidarity Trade Union Regional Headquarters in Krakow. 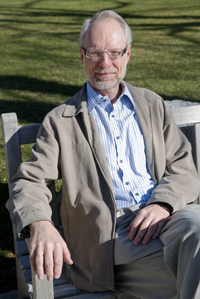 He taught at universities in the U.S. and Europe before coming to Hollins. His research interests include the economic and financial transformation of East-central Europe, European monetary integration, the stock market, and Catholic social teaching. Dadak has extensively published in English and Polish. His papers have appeared in The Wall Street Journal, Cato Journal, The Independent Review, Review of Business, Krakowskie Studia Miedzynarodowe, Miedzynarodowy Przeglad Polityczny, Arcana, and Ethos. His short pieces regularly appear in a major Polish national weekly, Gazeta Polska. He has also presented numerous papers at professional conferences.